Debra Haaland, New Mexico congressional candidate. GREATER CHACO, NEW MEXICO—Not even the most sacred sites in the New Mexican desert can escape the claws of the oil and gas industry. Throughout Navajo Nation lands on the outskirts of the 30,000-acre Chaco Culture Historical Park, metal mechanisms buzz and rattle as they penetrate the earth to extract fossil fuels hiding beneath the surface. Daniel Tso, a member of the Navajo Nation’s Torreon Chapter, is showing me around in his pickup truck. One of our stops? The site of the WPX Nageezi Fire, where 36 oil storage tanks burst into flames in 2016, forcing 55 people in the community to evacuate as the fire burned for days. Nearby juniper shrubs and piñon trees are still singed white from the blaze. This is a daily threat to the Navajo people who call the Greater Chaco Region surrounding the historical park home. While some locals support oil and gas extraction—many receive monthly royalties for allowing an energy company to develop on their land—a growing number of indigenous people, like Tso, have fought industry’s encroachment on their ancestral lands for years. It has been a losing battle. Development has only revved up since the early 1990s, and today, 91 percent of public land in Greater Chaco is leased to oil and gas. But the November midterm elections might finally offer industry’s opponents an opportunity to be heard and turn that statistic around. 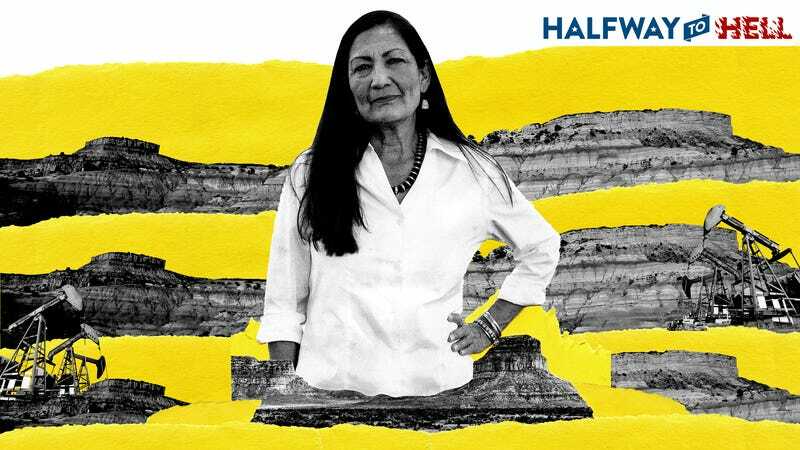 Debra Haaland is a congressional candidate for New Mexico’s first district and a member of the Pueblo of Laguna. She could become the first Native American woman in Congress and a national voice to protect Chaco Canyon, which holds deep cultural and spiritual significance to Pueblo, Navajo, and other Native American people in the state whose ancestors settled there. While the historical park’s famed archaeological sites are beyond industry’s reach, surrounding lands are not—and many believe they’re equally rich with cultural treasures. Haaland wants to protect those areas for good—and kick out the fossil fuel interests currently exploiting the land. This fight, however, won’t be an easy one to win. Forty-three parcels of land are slated for oil and gas lease sales in the Greater Chaco area come December, and not everyone has faith another Democrat in office—even a Native American one—can change that. While D.C. drama may be new to Haaland, New Mexico politics aren’t. As a law student, the now-57-year-old helped draft legislation that gave New Mexican tribal members access to in-state tuition at state schools. While she lost a bid for lieutenant governor in 2014, Haaland has sat on tribal boards and volunteered full-time for former President Barack Obama’s 2008 campaign. She eventually went on to chair the state’s Democratic Party. Haaland is now running for Congress—the first district includes Albuquerque and parts of surrounding counties—on the kind of agenda that has come to define the progressive left. She wants a $15 minimum wage nationwide and supports Medicare for all. She’s also one of the few progressives running this year on a platform to bring 100 percent renewable energy to their constituents. And she’s expressed support for a Green New Deal, which would propel the clean energy economy by creating new jobs in the growing market. But her dedication to protecting the environment isn’t just about climate change and the economy. It’s also about land, culture, and tradition. Haaland was a staunch supporter of the indigenous-led fight against Dakota Access Pipeline, visiting protest camps at Standing Rock in 2016. She was critical of President Donald Trump’s decision last year to obliterate the Bears Ears National Monument in Utah—a site designated largely due to its cultural and spiritual significance to Native American tribes. Across the country, Haaland wants to see public and tribal lands receive more protection from oil and gas development, including her own sacred lands in the Greater Chaco landscape. The giant boulders that dot the Greater Chaco area offer moments of peace to its visitors. Haaland’s views on land and the environment are in stark contrast with those of her opponent, Janice Arnold-Jones, who sat in the House of Representatives from 2003 to 2011. After discussing New Mexico’s acclaimed spicy green chile and agreeing that we hate litterers, we got down to politics, and the fault lines dividing the Republican candidate from her opponent became clear. Arnold-Jones sees industry as a way to get power to the people (especially tribal people) in the state where some still live without electricity. She didn’t seem ecstatic about increasing development near Chaco, but she also wasn’t stressed about protecting it, either. And she emphasized that fracking “is only a small part of the threat” to the region’s cultural sites, pointing to the natural forces of wind and rain that are constantly eroding the park. Between these two options, it’s clear why environmentalists have thrown their support behind Haaland, who is currently polling eight points higher than Arnold-Jones in her blue-leaning district. Still, campaign platforms and getting work done in a bitterly divided Congress are two very different things. 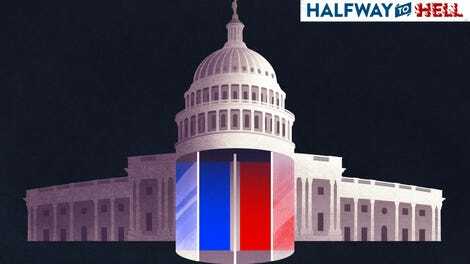 Political science professor Michael Rocca at the University of New Mexico said that as a freshman in Congress, it’s unlikely Haaland would be able to accomplish much her first couple of years should she win in November. Writing and passing bills takes seniority, and this year’s elections are pulling two of New Mexico’s most senior officials—Republican Steve Pearce and Democrat Michelle Lujan Grisham—out of the House as they fight for the governor’s seat. Their replacements in the House of Representatives, said Rocca, will lack the clout necessary to advocate for New Mexico, the state most dependent on federal funding. Luckily, Haaland’s got some senior Congress members on her court: Democratic senators Martin Heinrich and Tom Udall. Since May, they’ve been trying to push a bill through Congress that would create a buffer zone around Chaco Culture Historical Park to prevent any further oil and gas leases there. If Haaland wins, they’ll gain a critical voice that could help convince the rest of their colleagues to hop on board. Her input may actually help get this bill passed, which is feeling unlikely right now. If nothing else, Haaland’s win would be historic. Congress has never had a voice like hers, and it very well could gain two indigenous voices this year: Sharice Davids is another Native American woman running for a Democratic seat in the House in Kansas. “[Haaland’s] voice is going to matter in New Mexican politics,” Rocca said. Plenty of people in New Mexico agree—especially members of the state’s 23 tribes. At Albuquerque’s local Rise for Climate, Jobs, and Justice March on September 8, I met a mom-and-daughter duo, Ann Barudin and her 24-year-old daughter Sara Mayana Barudin. These Pueblo women want to see Haaland take the state 100 percent renewable, and that includes cleaning up Chaco. Nearly 70 miles north of Albuquerque closer to the Greater Chaco lands, people feel similarly. I met with Tesuque Pueblo Governor Frederick Vigil at the Tesuque Pueblo Farm, an organic farm that grows traditional crops and stores their seeds in a nearby bank. A tall and somewhat imposing figure, he gave a welcoming smile at the mention of Haaland. “She being a Native woman and coming from one of our community tribes, she understands our way of life,” Vigil told me as we stood before the farm’s brightly-colored rows of medicinal and edible flowers. Haaland can bring her people’s knowledge directly to Congress, which hasn’t always been welcoming to the worldviews of tribal leaders, Vigil said. That couldn’t be truer under the current administration, which has dedicated itself to supporting the fossil fuel industry above all else. Vigil’s opposition notwithstanding, oil isn’t pumping out of official Tesuque lands. To see diesel trucks pummeling down dusty dirt roads every day, you have to drive a bit northwest to the San Juan Basin. That’s where Tso lives. He’s a little more skeptical of Haaland, and he isn’t alone. Navajo Counselor Chapter President Harry Domingo Sr., whose lands sit within the Greater Chaco area and border the cultural park, wasn’t even familiar with Haaland. Former Chapter President Samuel Sage, meanwhile, told me he knew her from a while back and he “wasn’t impressed.” He hoped she’d bring state candidates out to see Navajo lands when she chaired the Democratic party, but that didn’t happen. He says he hasn’t seen much of her since she announced her run. Sage doesn’t doubt having a Native American woman in Congress would bring more attention to the issues his people face, but he worries Haaland might favor advocating on behalf of her Pueblo people over the Navajo. Haaland disagrees, of course, arguing that she’s spent plenty of time talking with people in the Navajo Nation—and that she plans to continue a dialogue about the future of Greater Chaco if elected. Still, some may disagree with her on what that future should look like. Families throughout the region, mostly Navajo, have earned income—anywhere from $100 a month to thousands of dollars—leasing their land off to these energy interests. For these people, oil and gas ain’t too bad. Unless something better comes along, why would they give up a steady paycheck? What’s more, a lot of the development in Chaco happened under former President Barack Obama. Whether a Republican or Democrat wins these elections, Tso expects little will change. This idea to stop fracking in the area entirely feels naive to him. Tso is more concerned about public health and safety than keeping industry off what little-untouched land remains. Are there emergency responders prepared for another disaster like the WPX Nageezi Fire in 2016? What about the longer-term public health crisis that’s unfolding as a result of all the pollution from both vehicles and extraction? Fracking emits pollutants like nitrogen oxides that can form ozone when mixing with sunlight, of which New Mexico has plenty. The Navajo Nation worries this pollution could lead to higher rates of respiratory illnesses and is behind the high cancer rates among its people, per a health report released last year. The chapters in New Mexico see some of the highest rates. Daniel Tso stands before a drill that’s creating a new fracking well on his people’s land. He wants to delay the December oil and gas lease sales on some of the remaining untouched land and hopes that Obama-era regulations on methane emissions from oil and gas, which the Trump administration has rolled back, end up reinstated. Haaland does want to do it all, she told me. She doesn’t think we should give up on kicking industry out of Greater Chaco, but at the same time, she wants to work on protecting communities where it’s already entrenched, whether that means fixing roads or building new clinics. Disentangling oil and gas from this landscape will be easier said than done. As Tso and I tour the region, that much is clear. Every twist and turn leads us to a new drill site, each seemingly larger than the last. We arrive at our final stop where a giant yellow drill stands tall against the backdrop of a white mesa and clear blue skies. Another well is coming here. And it won’t be the last.